I’ve always been a fan of setting New Year’s resolutions. It’s in my DNA. There’s something about a fresh start that’s simply irresistible to me. This year, however, I’ve been feeling an even bigger pull than usual to tap into the energy and possibilities the new year offers. Why is this year different? It’s a combination of a few things. I have a BIG birthday approaching this year…like a freight train. I want to meet that birthday feeling happy and excited, with the right mindset to begin the next decade of my life. I have been missing blogging and connecting with others through simplify 101. Now is a great time to make a fresh start on the blog. I have something new I want to share, and a renewed excitement for writing. I want something different in 2018 than I had in 2017. 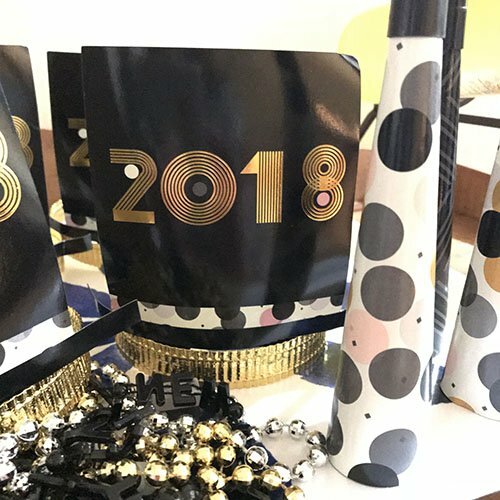 Yes, that’s what all New Year’s resolutions are about, but I have heightened awareness that change in a new year doesn’t happen just because a we put on party hats and blow horns at midnight. We don’t wake up on New Year’s Day feeling any different than the day before, just like we don’t wake up feeling any different on our birthday. In both cases, things are only one day different than they were the day before. There’s no radical transformation that happens when the calendar changes to a new year. Instead, change in the new year happens because we create it. We intend for something different and then take action to make it happen. What’s more, change happens when we stay focused and tenacious even after the excitement of the shiny new year fades. So what’s different about my approach this year than other years? Aside from the above, this year, instead of starting with a list of dreams or even goals, I started with an intention. It’s about how what I want things to be like in 2018. This seems like a subtle shift, but what it did was allowed me to connect with the bigger reason behind my goals and resolutions. Instead of feeling like a to-do list, the tasks and activities I identified feel directly tied to a higher purpose, my 2018 intention. Here’s a glimpse of the process I used. (it’s so new it isn’t even hung on the wall yet) and connected my heart to my hand. I jotted down everything that came to mind and when the dry-erase board got full, I snapped a photo with my phone so I could let the ideas keep flowing. I was amazed at how effortless the process was for me. My plan for the year was out of my heart in an hour’s time, which caused me to declare that hour as my most productive hour of 2017! In 2018 I intend to feel good and be happy so I can help others live a better life. When I wrote that on the dry-erase board, I teared up a little bit. It felt that right. This really encapsulates how I want things to be different in 2018. I am taking responsibility for how I feel both physically and emotionally, and then using that energy to help others. The last pillar is connection with others. What I know for sure is that when I feel better and I’m happier, I’m a better mom, wife, friend, and employee. And I hope, a better and more frequent blogger. That is my intention for 2018. And I invite you to join me. That can be as simple as reading along, sharing your thoughts in the comments, or identifying your own in intention and pillars for 2018. This will be a new journey. It will be a process of discovery. And I don’t have it all figured out just yet. But I’m really excited to see what what we create in the year ahead. That glass dry erase board sounds pretty great:) I agree that it takes intentionality.. would be nice if we could just wake up and have our resolution completed, but I think there is growth and value in the journey. We appreciate what we’ve consciously worked toward much more than what drops into our laps. Happy to be sharing in your blogs, and wishing you a happy new year! Looking forward to future posts unpacking what this new shift in goal making looks like! Thanks for sharing!